Academic stumbles upon previously unseen section of Codex Sinaiticus dating back to 4th century. Nikolas Sarris spotted a previously unseen section of the Codex Sinaiticus, which dates from about AD 350, as he was trawling through photographs of manuscripts in the library of St Catherine's Monastery in Egypt. The Codex, handwritten in Greek on animal skin, is the earliest known version of the Bible. Leaves from the priceless tome are divided between four institutions, including St Catherine's Monastery and the British Library, which has held the largest section of the ancient Bible since the Soviet Union sold its collection to Britain in 1933. Academics from Britain, America, Egypt and Russia collaborated to put the entire Codex online this year but new fragments of the book are occasionally rediscovered. Mr Sarris, 30, chanced upon the fragment as he inspected photographs of a series of book bindings that had been compiled by two monks at the monastery during the 18th century. Over the centuries, antique parchment was often re-used by St Catherine's monks in book bindings because of its strength and the relative difficulty of finding fresh parchment in such a remote corner of the world. A Greek student conservator who is studying for his PhD in Britain, Mr Sarris had been involved in the British Library's project to digitise the Codex and quickly recognised the distinct Greek lettering when he saw it poking through a section of the book binding. Speaking from the Greek island of Patmos yesterday, Mr Sarris said: "It was a really exciting moment. Although it is not my area of expertise, I had helped with the online project so the Codex had been heavily imprinted in my memory. I began checking the height of the letters and the columns and quickly realised we were looking at an unseen part of the Codex." Only a quarter of the fragment is visible through the book binding but after closer inspection, Father Justin was able to confirm that a previously unseen section of the Codex had indeed been found. The fragment is believed to be the beginning of Joshua, Chapter 1, Verse 10, in which Joshua admonishes the children of Israel as they enter the promised land. Speaking to The Art Newspaper, Father Justin said the monastery would use scanners to look more closely at how much of the fragment existed under the newer book binding. "Modern technology should allow us to examine the binding in a non-invasive manner," he said. Mr Sarris said his find was particularly significant because there were at least 18 other book bindings in the monastery's library that were compiled by the same two monks that had re-used the Codex. "We don't know whether we will find more of the Codex in those books but it would definitely be worth looking," he said. The library in St Catherine's does not have the laboratory conditions needed to carefully peel away the binding without damaging the parchment underneath but the library is undergoing renovations that might lead to the construction of a lab with the correct equipment to do so. Although earlier fragments of the Bible have survived the passage of time, the Codex Sinaiticus is so significant because it is by far the most complete. The full text that has been discovered so far contains virtually all of the New Testament and about half of the Old Testament. But whenever an ancient version of the holy book is found, it often raises questions about the evolution of the Bible and how close what we read today is to the original words of Christ and his early followers. The Old Testament was written largely in Hebrew (with the odd Aramaic exception) but it is by no means a homogenous entity. Protestant and more recent Catholic versions of the Bible tend to use the Masoretic Text, a variation of the Hebrew Old Testament that was copied, edited and distributed by Jewish Masorete scholars between the 7th and 11th centuries. 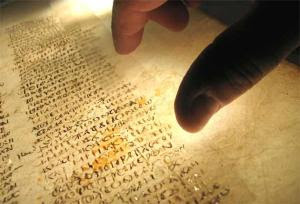 Earlier Catholic translations and the Greek and Russian Orthodox churches use the Septuagint, an ancient Greek version of the Hebrew text that was translated between the 3rd and 1st centuries BC. In studying the early history of the New Testament, historians have about 5,650 handwritten copies in Greek on which they can draw, many of which are distinctly different. As Christianity consolidated its power through the first millennia, the four gospels of Matthew, Mark, Luke and John came to form the key elements of the New Testament. But other apocryphal writings were discarded along the way. The Shepherd of Hermas, for instance, is a Christian literary work of the 2nd century which appears in the Codex Sinaiticus and was considered part of the Bible by some early Christians but was later expunged. The most well-known apocryphal gospel is that of Thomas, a collection of 114 numbered sayings attributed to Jesus that was discovered in 1945. As it never refers to Jesus as "Christ", "Lord" or the "Son of Man" (and lacks any mention of the miracles attributed to Jesus in the other gospels) it is perhaps not surprising that it never made it into later versions of the Bible.